Get Out was one of my favorite films of 2019. What made that movie especially impressive was that it was Jordan Peele’s first time in the director’s chair. Get Out demonstrated all of the best characteristics of a classic in the making. The horror, the humor and the social commentary were all balanced perfectly and made for a cohesive and thrilling movie-going experience. Needless to say, the hype for his follow-up, Us, was real. Us follows a family on vacation that are confronted by their doppelgangers. Saying any more would be spoiling the numerous twists and turns throughout the film. Perhaps my fever-pitch levels of anticipation are to blame for me leaving the theater tinged with slight disappointment upon seeing Us. The film has ambition and creativity to spare, but it didn’t coalesce into a satisfying whole. By design, Us is a less organized film than Get Out and has much more things on its mind at all times. This is good in the sense that it gave my brain some interesting things to chew on, but I also got the impression that the film didn’t know how to just pick a lane and stay in it. Get Out had one goal, and it accomplished it, Us has five or six things on its mind thus diluting the message of each and confusing the over-arching narrative. As I thought about this film (and I thought a lot), I did find some connectivity between the various themes at play, but not enough to justify having so many. In my mind, it’s about the upper class/lower class divide, slavery, having your voice be heard, the state of the U.S. today and in the past, and finally; duality. Some of these go together like peanut butter and jelly and some don’t. If Peele had cut out a couple of them and focused on, say, three themes that feed naturally into one another, the film could have hit home a lot harder. There’s still some great conversations to be had about the movie, and a lot to think on, but it lacks a certain level of cohesion that I tend to appreciate in films. Don’t get me wrong though, this is still a solid exercise in horror and often times a delight to watch. There are few who are as good at blending horror with comedy and social commentary than Jordan Peele and Us is no slouch at the former two. Despite not being the masterpiece that Get Out was, there are still some truly inspired, outside-of-the-box moments that taken alone make this film worth the price of admission. The cast is also exemplary. 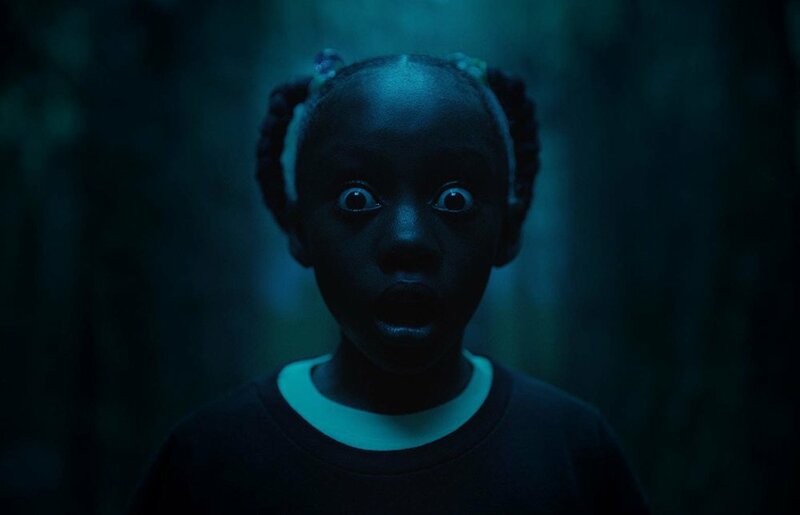 Lupita Nyong’o is doing some of her best work yet here as Adelaide Wilson and her doppelganger Red, the latter of which she commits to a disembodied, inhuman-sounding voice that is just scary enough to not be campy. Winston Duke brings the heart and the laughs as the love-able father/husband Gabe Wilson, along with menace to the silent, brooding doppelganger, Abraham. There are also some pretty great child performances in Us, especially from Shahadi Wright Joseph, who plays the daughter Zora along with her doppelganger, Umbrae. Tom Heidecker and Elizabeth Moss are also great and hilarious in supporting roles as Josh and Kitty Tyler who are friends to Adelaide and Gabe. Another thing Jordan Peele and his team excel at are finding an effective look, feel and sound for their films. Us is less contained than Get Out, and Peele along with cinematographer Mike Gioulakis are able to stretch their cinematic muscles a little further. The effective uses of color and lighting make the film more immersive and engaging. In addition to this, the score and use of licensed tracks here is pitch-perfect. The traditional score by Michael Abels is effective and chilling in all of the right ways and the various uses of “I Got 5 On It” by Luniz feat. Michael Marshall is played to great effect in multiple scenes, also “Good Vibrations” by The Beach Boys and “F*** The Police” by N.W.A. Awesome. I’ll just let those sit there without context. Us is a perfectly enjoyable horror film that knows when to be funny but not at the expense of the scares. Jordan Peele fumbles the ball with the narrative, which can be muddled and confusing at times, but still provides a unique experience that is enjoyable from start to finish. It’s not Get Out, but it’s much better than your standard horror fare, and it is destined to inspire many thought-provoking conversations going forward.